Smoky Roast Mushroom Bowls recipe here. Apart from a nice glass / bottle of wine, my vices are modest. In truth, my biggest addiction is books. This year I decided to stop buying magazines and put my money into new cookbooks instead. Definitely a good decision and one I’m planning to continue into the new year. When you’re in the mood for making some Chinese-ish food this is the book for you. Have been loving using the book to inspire some Saturday date night feasting with my Irishman. Definitely not simple but definitely delicious! Have made so many dishes from this book. Wins the award for most cooked from book for 2017 in the Stonesoup kitchen. Love how Middle Eastern food can taste so exotic while using mostly every day ingredients. Worth it for the Lamb Sharwama recipe alone! I’ve discovered a source of Australian tacos made using an ‘authentic’ Mexican recipe so have had many great ‘taco’ nights inspired by fab little book. The recipes are generally complex but worth it for a weekend feast! The Breddos restaurant / shack is high on my list next time I’m in London. This was a surprise ‘bowling ball’ (Simpsons reference) birthday present from my Irishman who is a big fan of Taylor’s indie band ‘Grizzly Bear‘. Love the beautiful photographs and simple seasonal menus. A good book for entertaining. Love the fresh simple recipes from this Melbourne deli with both Italian and Middle Eastern heritage. This re-ispired me to get into making dukkah and putting it on everything. If you get it, make sure you make the Farro & Pesto Salad. Soo good! My all-time favourite Indian cookbook. Ever since I worked as a waitress in an Indian restaurant during my university days I’ve loved Indian food. Until this book my Indian home cooking was a bit hit and miss. Have loved everything I’ve made from this book – ‘all winners’ as a friend of mine said. Every time I go to Sydney I’m still devastated that Mike closed his Rosebery restaurant. Luckly his cookbooks let me experience the joy of Mike’s food from the comfort of my own little kitchen. Hands down my favourite food blog at the moment. I thoroughly enjoyed cooking my way through this beautiful book of creative ways to serve vegetables. Bemis is a vegetable farmer, fellow beet-lover and girl after my own heart. Loved the first book from the Sydney Cornersmith cafe and can’t wait to dig in to this next edition. Especially love the idea of vegetables with more taste and less waste – girls after my own heart. Long term readers of Stonesoup will know that Nigel Slater (aka ‘St Nigel’) is one of my all time favourite food writers. This is going to be an early Christmas gift to myself. Loved the December entries of all the ‘Kitchen Diaries’ books and looking forward to using this to get into the festive spirit. Especially exciting this year because we’re having a Northern Hemisphere Christmas with my Irishmans family. As you may have guessed by now I have a big thing for Middle Eastern and North African food. This classic Moroccan cooking bible has been on my wishlist for a while now. Hoping Santa decides to pick up a copy for me this year! 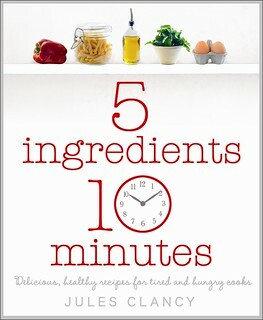 Then check out my print book ‘5-Ingredients 10-Minutes‘. It’s as simple as cooking can get without sacrificing flavour or resorting to processed ingredients. These are great cookbooks to read indeed! Thanks for the recommendation. Apart from that I wish I had more time for baking and cake-decorating, so I have been getting beautiful books on that matter. Dear Jules, first of all a huge thank you for all the hard work you put in to produce these amazing recipes here and on your diabetes site. It is a true God send! I have used many of your recipes and love the ‘adaptions’ underneath it recipe to make them accessible to many. A thought from some of your veggie/ vegan ideas especially- frittata (egg based). You can substitute chickpea flour for the eggs. I have had success with this and even egg fans have enjoyed them. The beauty is that varying thickness you can make pancakes, thin omlettes or even thick sliced frittatas. What do you think? There are many recipes out there that I am sure you can work your magic on! Keep up the good work. Just received my copy of Dr Joseph Mercola and Pete Evans Fat for Fuel Ketogenic Cookbook yesterday – it is absolutely fabulous for anyone wanting great really healthy delicious recipes. Can’t recommend it enough! My two favourites (at least one was published this year) are ‘Neighbourhood’ and ‘Community’, both by Hetty McKinnon. I think you’d love them. I love Hetty’s blog Angela! I have hundreds of cookbooks. If I buy any more, the woman I have not as yet married would disown me. The most fun is to read half a dozen recipes for the same dish. Put the books away. Cook the meal. No cheating. One of the better mushroom recipes I have came from a science teacher in the seventh grade. He said to slice either white mushrooms (or LBMs – baby ‘bellas). Pour home made Italian dressing over the mushrooms and let them “steep” overnight. Even a seventh grader could get this right. Eat them as is, put them in a salad, or cook with them. Yum. Loving the marinated mushroom idea. Thanks Daryle. Hi Jules just wondered if you are a member of your local library. My library has a digital portal (is that the right word?) for magazines (and books too) and many magazines are available to read on your ipad or computer. Might be worth a look if you miss you magazine reading. p.s. Your blog is great!